At the beginning of a new year, the superintendent of the Heritage District finds ancient wisdom about community to be good counsel for Michigan disciples. I’m still being greeted with “Happy New Year,” as I meet with the people of the Heritage District. Each greeting reminds me that the New Year is a time of excitement for me. I dream and anticipate all the things that will unfold in the months ahead. A new year is like beginning a new book full of new thoughts and ideas. The new year provides opportunities in the district to dream together ways in which we can work to make disciples of Jesus Christ for the transformation of the world. The people of the Heritage District have an opportunity to make a difference in their communities. Clergy in the local churches are gathering in our Zone groups, where they have time to pray for one another, for their churches and their communities. These meetings allow conversation around missions and ministries at the local churches as they work together to implement shared ministries and missions within their zone. I believe that churches working together have an opportunity to reach better those in our communities who are not a part of our congregations. At the Heritage District Church Conferences, I shared the passage from Acts 2:42-47 entitled the Community of Believers (CEB). 42 The believers devoted themselves to the apostles’ teaching, to the community, to their shared meals, and to their prayers. 43 A sense of awe came over everyone. God performed many wonders and signs through the apostles.44 All the believers were united and shared everything.45 They would sell pieces of property and possessions and distribute the proceeds to everyone who needed them.46 Every day, they met together in the temple and ate in their homes. They shared food with gladness and simplicity.47 They praised God and demonstrated God’s goodness to everyone. The Lord added daily to the community those who were being saved. This, I believe, is how the 21st-century Christian churches should continue to work. The community comes together to learn and grow in their personal relationship with God and Jesus while working to share their faith through the people they encounter at home, work, school, and community. Many in the community are hurting and are in need of physical and spiritual care. Our neighbors need to know that there is a community of Christian believers at the local United Methodist Church, who will open their doors to new people, making room at their tables for new faces. 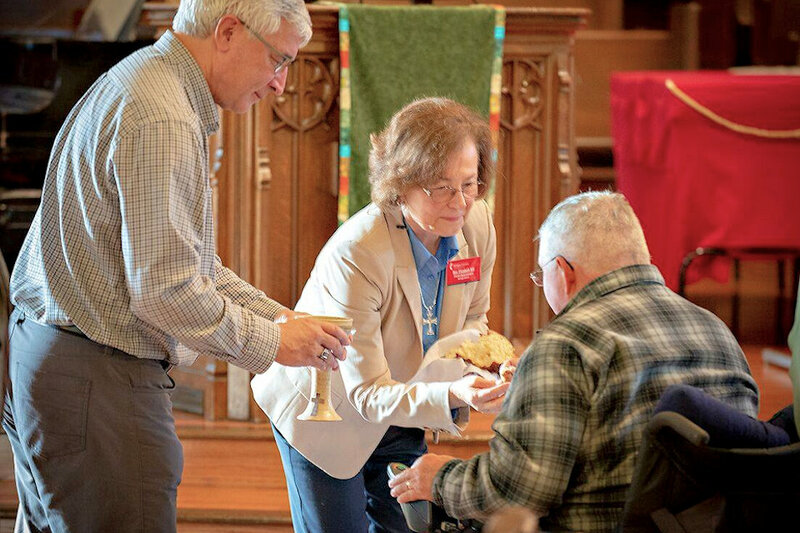 Together, the early church accomplished taking care of their neighbors’ physical needs while feeding them spiritually with the Good News of Jesus Christ. This is true for the United Methodist Church today! Let us go out the church doors shining the light of Christ to all we meet earnestly desiring to share the Gospel message.